Complete with rides, a water park, 18 holes of miniature golf, a haunted house and an arcade game area, Fun-Plex has something for simply everybody in your group! Start your day with a thrilling ride aboard Nebraska's only roller coaster rightly named The Big Ohhhhhh!!! which you really can't miss seeing as it towers the whole park! After that, gather your heart by taking a gentle Ballon Ferris Wheel ride to get aerial views of the park and surrounding areas. For a speed you can control, don't forget to check the Fun-Plex Slick Track for go-kart fun, while the very popular Tilt-A-Whirl will provide for a spinning experience. At the water park, you won't want to miss Typhoon Waterslides where a 5 story series of tubes are waiting for you to take the plunge! For a gentler ride, check out the Lazzzy River or Motion Ocean, a wave pool for all ages! Open seasonally is the park's Nightmare on Q Street, a haunted house bound to keep your hairs sticking up from start to end! 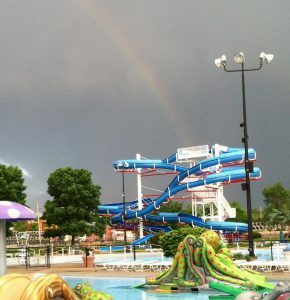 Other Specials & Coupons To view Fun-Plex Admission Tickets, other Specials and Coupons, go to their special page by clicking here. Fun-Plex updates this page throughout the year, so check back to see if new specials and coupons have come in. Note to our visitors Fun-Plex coupons and specials can change without notice. So please visit their official website to make sure of the latest pricing and coupons.